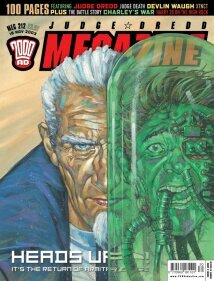 The Judge Dredd Megazine Odyssey: Meg 212 - Heads Up! A new thrill this issue was Armitage: Apostasy In The UK. Armitage is a Brit-Cit cop, a detective rather than a Judge. His job is to work crimes like the CID do in the UK police force today, and he can call upon Judges for backup. He is grumpy, over-worked and under-paid and is feeling his age. His sidekick, Steel, is young and keen - which seems to make him even grumpier. I like this character, and the story line looks like a classic detective story that I like anyway (I'm a big Sherlock Holmes fan, and there are certainly elements to that side of British crime writing in this story style). I guess Armitage reminds me a little of Morse, but grumpier! Dave Stone is the script droid for this story, and the marvellous John Ridgeway handles the art. Looking forward to seeing how this one plays out. Blazing Battle Action concluded with a look at the decline of the comic title - as it agreed a licence with the Action Force toy line. A lot of creators moaning about the loss of quality and the declining standards. Funnily enough, this is where I jumped on, sucked in by having Action Force figures. I enjoyed the stories as a kid, and of course, had no clue that the art of John Cooper I admired so much was absolutely hated by the artist himself. He was very upset to be taken off Johnny Red and put on the kids toys section. The other text articles saw D'Israeli in the Interrogation Cube where he reveals he is learning German and his girlfriend reads out loud to him if he is working late. And, joy, grumpy grots himself Gordon Rennie is back for his You're Next, Creep column. In my last post, I was moaning about the amount of adverts for Dredd vs Death. In his column, Gordon moans about books of comics, games of books of comics, and so on. Good to have you back, sir! Apocalypse Soon dipped a little for me this week. Hopefully it is setting up for something next time.